eDivision of Neurology (J.S., A.P. ), Toronto Western Hospital, Toronto, Ontario, Canada. Background: Acute ischemic stroke occurs more frequently, presents with more severe symptoms, and has worse outcomes in elderly patients. The safety and efficacy of endovascular therapy for acute stroke in this age group has not been fully established. Purpose: We present the results of a systematic review and meta-analysis examining clinical, procedural, and radiologic outcomes of endovascular therapy for acute stroke in patients older than 80 years of age. Data Sources: We searched PubMed, MEDLINE, and EMBASE from 1992 to week 35 of 2017 for studies evaluating endovascular therapy for acute stroke in the elderly. Study Selection: Two independent reviewers selected studies and abstracted data. The primary end point was good functional outcome at 3 months defined as modified Rankin Scale score of ≤2. Data Analysis: Data were analyzed using random-effects meta-analysis. Data Synthesis: Seventeen studies reporting on 860 patients were included. The rate of good functional outcome at 3 months was 27% (95% CI, 21%–32%). Mortality at 3 months was 34% (95% CI, 23%–44%). Successful recanalization was achieved in 78% of patients (95% CI, 72%–85%). Procedure-related complications occurred in 11% (95% CI, 4%–17%). The incidence of intracranial hemorrhage was 24% (95% CI, 15%–32%), and for symptomatic intracranial hemorrhage, it was 8% (95% CI, 5%–10%). The mean time to groin was 251 minutes (95% CI, 224–278 minutes). Procedure time was 99 minutes (95% CI, 67–131 minutes). Limitations: I2 values were above 50% for all outcomes, indicating substantial heterogeneity. Conclusions: Good functional recovery in octogenarians treated with endovascular therapy for acute stroke can be achieved in a high proportion of patients despite the higher incidence of comorbidity in this cohort. Outcomes are inferior to those reported for younger patients; however, endovascular therapy can allow at least 1 in 4 patients older than 80 years of age to regain independent function at 3 months. More research is required to improve patient selection in the elderly, but age should not be a discriminator when deciding to offer endovascular therapy for patients with acute stroke. A comprehensive literature search of the databases PubMed, Ovid MEDLINE, and Ovid EMBASE was designed and conducted by an experienced librarian with input from the authors. The key words “stroke,” “mechanical thrombectomy,” “elderly,” “octogenarian,” “nonagenarian,” and “outcomes” were used in “AND” and “OR” combinations. The search was limited to articles published from 1992 to week 35 of 2017. All studies reporting outcomes of mechanical thrombectomy in patients older than 80 years of age were included. Inclusion criteria were the following: 1) English language, 2) studies reporting patients with acute stroke treated endovascularly in a patient population 80 years of age or older, and 3) studies reporting at least 3 months of clinical follow-up. Studies including patients treated with older endovascular modalities (ie, Merci retriever [Concentric Medical, Mountain View, California], intra-arterial thrombolysis alone, and so forth) were excluded. Two of the authors selected the included studies (C.A.H., P.N.). Differences were resolved by a senior author with 5 years of experience in meta-analysis (W.B.). For each study, we extracted the following baseline information: number of patients, mean or median age, imaging selection criteria, clinical selection criteria, exclusion criteria, mean or median NIHSS score, mean or median ASPECTS, endovascular technique used, type of study (prospective or retrospective), number of patients achieving a good functional outcome (defined as a modified Rankin Scale score of ≤2 at 3 months), number of patients in whom successful recanalization was achieved (defined as TICI 3 or 2b), procedure-related complications (eg, vessel perforation and groin complications), number of patients with intracranial hemorrhage and whether this was symptomatic, time from symptom onset to intervention (defined as groin puncture), and procedure time. The primary end point of this study was good functional outcome at 3 months. Secondary outcomes included the following: mortality at 3 months, rate of successful revascularization, rate of procedure-related complications, rate of intracranial hemorrhage including symptomatic intracranial hemorrhage, time from symptom onset to groin puncture, and procedure time. We modified the Newcastle-Ottawa Quality Assessment Scale to assess the methodologic quality of the studies included in this meta-analysis. This tool is designed for use in comparative studies; however, because the studies did not include a control group, we assessed study risk of bias based on selected items from the tool, focusing on the following questions: 1) Did the study include all patients or consecutive patients versus a selected sample? 2) Was the study retrospective or prospective? 3) Was clinical follow-up satisfactory, thus allowing ascertainment of all outcomes? 4) Were outcomes clearly reported? We estimated from each cohort the cumulative incidence (event rate) and 95% confidence interval for each outcome. Confidence intervals were symmetric and 2-sided. Event rates for each intervention were pooled in a meta-analysis using the random-effects model.25 Anticipating heterogeneity between studies, we chose this model a priori because it incorporates within-study variance and between-study variance. Heterogeneity of treatment effect across studies was evaluated using the I2 statistic, in which I2 > 50% suggests substantial heterogeneity.26 A sensitivity analysis was conducted to compare the primary end point (good functional outcome at 90 days) among the included studies, depending on whether they reported an exclusion criterion of a premorbid mRS of ≥2. Statistical analysis was conducted using STATA software, Version 14 (StataCorp, College Station, Texas). The initial literature search yielded 1072 articles. On review of the abstracts and titles, we excluded 1008 articles. Sixty-four articles were selected for full-text screening. Of these, 24 were excluded (case reports, conference abstracts, review articles, and 1 article written in Russian). In all, 40 potentially relevant articles were identified. Of these, a further 23 were excluded for the following reasons: Some studies did not separate patients by age, the definition of elderly was too young, some studies reported outdated endovascular techniques (primarily those that included patients treated with the first-generation Merci device), and 1 study only provided the mRS score at 30 days rather than at 90 days. In total, 17 articles including 860 patients aged 80 years or older who underwent EVT for acute stroke were included. In all studies, either a stent retriever alone was used as the primary method of recanalization or a combination of stent retriever plus or minus aspiration. One study included patients who had undergone intra-arterial thrombolysis in addition to stent-retriever and/or aspiration. Five studies were prospective, and 12 were retrospective. Overall, 3 were considered to have a low risk of bias (using a modified Newcastle-Ottawa Quality Assessment Scale), whereas 14 had limitations. Clinical and imaging inclusion criteria for EVT varied considerably in the studies (On-line Table). Eight of the 17 included studies only performed EVT in patients with acute stroke with a premorbid mRS of ≤2. All except 5 studies clearly defined their inclusion criteria. All included studies reported mRS at 3 months. The smallest study included 16 patients, and the largest study included 111 patients. A summary of included studies is provided in On-line Table. A flow chart for study selection is provided in Fig 1. The mean/median presentation NIHSS score was 17.8 (available for 16 studies). Seven studies included presentation ASPECTS with their results, the mean of which was 8.5. Flow chart for study selection for studies included. Overall good functional outcome (mRS ≤2) was achieved in 27% of patients (95% CI, 21%–32%). A meta-analysis forest plot for good functional outcome at 3 months is shown in Fig 2. Overall mortality (reported by 14 studies) was 34% (95% CI, 23%–44%). Successful recanalization (reported by 15 studies) was achieved in 78% of patients (95% CI, 72%–85%). Procedure-related complication rates (reported by 4 studies) were 11% (95% CI, 4%–17%). The incidence of intracranial hemorrhage (reported in 10 studies) was 24% (95% CI, 15%–32%), and for symptomatic intracranial hemorrhage (reported by 14 studies), the incidence was 8% (95% CI, 5%–10%). The overall reported mean time to groin (documented in 13 studies) was 251 minutes (95% CI, 224–278 minutes). Procedural time in these elderly patients was 99 minutes (95% CI, 67–131 minutes). A summary of the results is shown in the Table. Meta-analysis forest plot for good functional outcomes at 3 months. Eight of the 17 included studies only performed EVT in patients with a premorbid mRS of ≤2. A statistically significantly higher proportion of patients achieved a good functional outcome at 90 days (mRS ≤2) in those studies that only included premorbidly independent patients compared with those studies that did not have this prerequisite (P = .007). The mean rate of good functional outcome at 90 days in the studies with this inclusion criterion was 31.7% (95% CI, 18.4%–41.1%) compared with 20.4% (95% CI, 16.1%–24.7%) in those studies that did not use this criterion. Heterogeneity of treatment effect across studies was evaluated using the I2 statistic, in which I2 >50% suggests substantial heterogeneity.26 Substantial heterogeneity was noted for all outcomes. The calculated heterogeneity of treatment effect for good neurologic outcome at 3 months was I2 = 70%. This systematic review and meta-analysis of 16 observational studies9⇓⇓⇓⇓⇓⇓⇓⇓⇓⇓⇓⇓⇓⇓–24 and data from the HERMES study,8 including 860 patients 80 years of age or older who underwent mechanical thrombectomy for acute ischemic stroke, has demonstrated a number of compelling findings. First more than one-quarter (27%) of patients achieved good functional outcome (functionally independent) at 90 days, while one-third (34%) of patients died. Excellent rates of TICI 2b/3 recanalization were achieved, close to 80%. Symptomatic intracranial hemorrhage rates were 8%, and procedural complication rates were approximately 11%. These findings suggest that mechanical thrombectomy provides substantial benefit to a sizeable proportion of octogenarians, despite the associated comorbidities in this cohort of patients. More work is, however, still needed to further improve stroke outcomes in this patient population. These findings are particularly important, given that this demographic group will likely represent a growing proportion of mechanical thrombectomy candidates as the life expectancy of the general population continues to increase. Ischemic stroke has increasing incidence with age and tends to present with more severe symptoms and has worse outcomes in the elderly compared with younger patients. Thus, it is of interest to determine the safety and efficacy of EVT in this older age group. The randomized trials that have established the remarkable effectiveness of EVT for patients with stroke with large-vessel occlusions do not conclusively answer the question of the value of EVT for octogenarians in daily practice. Exclusion of patients older than 80 years in some trials5⇓–7 and the relatively low number of these patients compared with other age groups in those trials that did not consider age among the inclusion criteria27⇓–29 are limiting factors that must be taken into consideration when interpreting the data from these randomized controlled studies. The HERMES meta-analysis8 of 5 randomized controlled trials of EVT (n = 1287 including 634 assigned to mechanical thrombectomy; mean age, 68 years) reported good functional outcomes in 46% of patients and a mortality rate of 15%. However, among patients 80 years of age and older in the EVT arms, the rates were 29.8% for good 90-day functional outcome and 28% for mortality. These results are comparable with those that we obtained through our meta-analysis of observational studies (which also included data for octogenarians from the HERMES meta-analysis). Our meta-analysis did demonstrate a higher rate of symptomatic intracranial hemorrhage than the randomized trials (8% compared with 2%–5% across all age groups in the trials8,30) as well as high rates of procedure-related complications (11%). Meta-analysis of trial data clearly demonstrated that octogenarians treated with EVT had markedly better chances of achieving a good functional outcome compared with patients not treated with EVT8 (common odds ratio = 3.68; 95% CI, 1.95–6.92), in great part because of the poor outcomes observed in the latter group. Thus, EVT should be offered to patients aged 80 years and older. The challenge remains how to identify those older patients who will not benefit from recanalization to avoid futile and potentially harmful interventions. Eight of the 17 studies, including the HERMES data, included only octogenarians who were premorbidly functionally independent (mRS ≤2). The mean rate of good functional outcome (mRS <2) at 90 days was higher in studies that included only premorbidly independent patients compared with those that did not (20% compared with 32%). This finding highlights the need for careful patient selection for EVT in older patients. An inclusion criterion of only treating patients with a premorbid mRS of ≤2 may still exclude a large proportion of patients with stroke (of any age) who could benefit from EVT. An mRS of 3 may convey a good quality of life in a patient older than 80 years of age, and the potential “shift effect” of EVT toward a lower mRS may still be regarded as a very favorable outcome. While data in this meta-analysis were derived from a strictly defined patient population with at least 3 months of follow-up, our study has limitations. In our assessment of study risk of bias, most of the studies had a medium risk of bias. Publication bias is also possible because centers with better results in treating older patients with stroke may have been more prone to report their results (however, if present, this bias would overestimate the chances of recovery after EVT). I2 values were >50% for all outcomes, indicating substantial heterogeneity. Marked variability in patient imaging and clinical inclusion and exclusion criteria across studies may have contributed to this heterogeneity. The 2 studies that reported the worst outcomes included only patients older than 90 years. If these studies were excluded from the meta-analysis, the overall proportion of patients with good neurologic outcome would have slightly increased to 28%. Few studies provided detailed and quantifiable descriptions of the premorbid condition of the patients they treated (On-line Table). 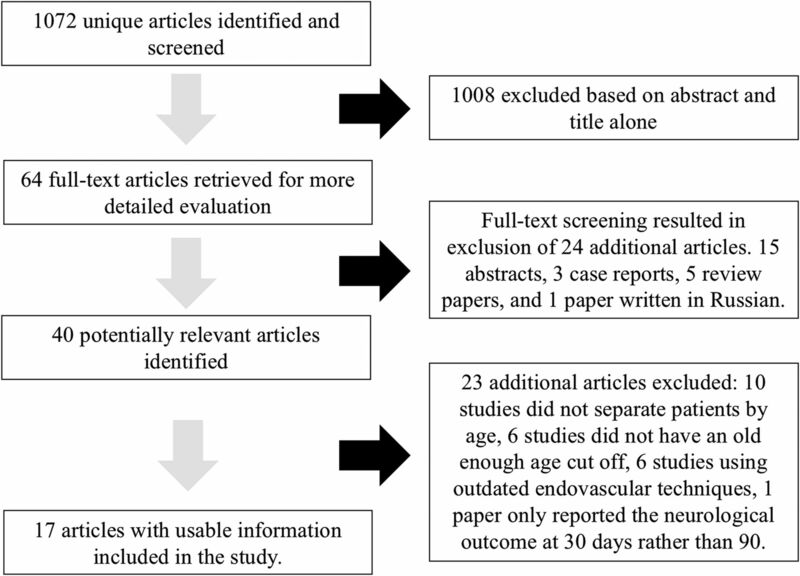 Overall, the quality of evidence (confidence in estimates) is low because of imprecision, heterogeneity, and methodologic limitations of the included studies.31,32 Due to lack of availability of data from the individual studies, it was not possible to stratify outcomes on the basis of stroke onset-to-recanalization time, concomitant use of thrombolytic therapy, type of anesthesia used, or patient collateral or perfusion mismatch status. It was not possible to perform an mRS shift analysis from the data collected from the included studies, and this issue may have underestimated the benefit of EVT for acute stroke in elderly patients. A large proportion of patients 80 years of age or older with severe stroke from large-vessel occlusion can benefit from EVT, and good recanalization rates can be achieved. Our findings suggest that age should not be a discriminator of whether EVT should be attempted in acute stroke. The outcomes in older patients are, however, poorer than in younger patients. When one counsels patients and families, they should be informed that recovery of independent function can be expected in approximately 1 in 4 cases. Further research is necessary to refine selection criteria for EVT in this age group. Disclosures: Alejandro Rabinstein—UNRELATED: Grants/Grants Pending: DJO Global*; Royalties: Oxford University Press, Elsevier. Waleed Brinjikji—UNRELATED: Consultancy: Johnson & Johnson. *Money paid to the institution. Data could be made available by contacting the corresponding author via e-mail. Accepted after revision January 24, 2018.